Boston Mayor Martin Walsh at the Chinatown Neighborhood Center’s tea ceremony Friday. Walsh, along with the Boston Housing Authority and Inquilinos Boricuas en Acción, have started a project centered around rehabilitating affordable housing in Boston’s South End. 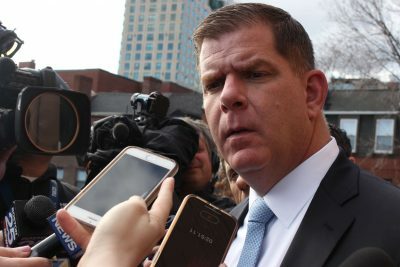 Boston Mayor Martin Walsh has launched a project aimed at rehabilitating affordable housing in Boston’s South End with the Boston Housing Authority and Inquilinos Boricuas en Acción, a community development organization. The project will focus on renovating the area’s West Newton/Rutland apartments and will transfer ownership of the properties from the BHA to IBA, according to a BHA press release. IBA will work on renovating the apartments, and the construction is aimed to be completed in two years, according to IBA CEO Vanessa Calderón-Rosado. The project will ensure that more than 140 of the apartments remain affordable for the next 99 years. Renovations will include repairs to stonework, new doors and windows, accessible ramps and a sprinkler system. Additionally, 11 of the units that are currently classified as uninhabitable will be made livable, while eight other units will be renovated to be more accessible, according to the release. The South End has 48 percent of the city’s income-restricted housing, which is more than any other Boston neighborhood, according to a report on Boston’s income-restricted housing. The $47.2 million project is funded by a number of sources, including federal and state tax credits and a loan of $7.76 million from a collection of groups including Wells Fargo, MassHousing and the U.S. Department of Housing and Urban Development. Funding for 110 of the apartment renovations will come from HUD, while the BHA’s Section 8 project-based vouchers will fund work on the other 36 apartments, the release stated. Calderón-Rosado said getting funding for the project took multiple years because of a need for multiple revenue sources. One of the reasons IBA chose to renovate a part of the South End, she added, was the organization’s deep roots and involvement in the neighborhood. “Developers have to pull a number of revenues to make these things happen, not one single source funds a whole project,” Calderón-Rosado said. Thomas Farmer, a spokesperson for MassHousing, wrote in an email that the organization has worked with the BHA and the city over the past 17 years to revitalize almost 2,000 in-need public housing rental units in Boston. Andrew Keeter, 28, of Brighton, said he is in favor of the rehabilitation plan himself but thinks that wealthier South End residents may be against it. Cody Belland, 26, of Brighton, said he thinks the project will benefit Boston, as the city is facing an affordable housing crisis. Sophia Nikolayev, 33, of Allston, said she wanted Walsh to invest more in affordable housing. Wow neat article, good shout on the whole housing crisis!